Trade shows and events tend to be busy, sometimes overcrowded affairs, and the bigger exhibitions, in particular, will have numerous stands. That can make it intensely competitive to draw attention to your business’ presence. If you want to stand out, you need to do something different. 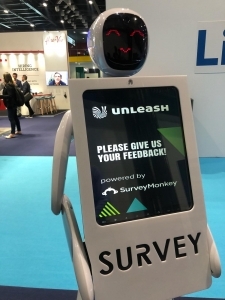 While you may not have thought robots and exhibition stand were two things that went naturally together, a robot can really boost traffic to your stand at an event and carry out a number of useful functions while promoting your brand. Even entertain those passing by your stall by singing and dancing! What’s more, there is now a greater variety of robots than ever before. You could have a robot to be a specific character, such as an estate agent or shop assistant, while models such as LED laser robots are also available. If you are doing something involving speakers as part of an event, a robot can do things like changing the slides, introducing or even giving the keynote speech – something you may never have realised a machine could do! When it comes to the finances of robots for exhibition stands, you need to weigh up the cons of buying or hiring one. A lot may depend on how many events you may attend during a year, and whether your events usually last for one, two or three days. Location of the exhibitions you attend is another consideration. Equally, will you want the same software for each one? Consider the technical support you are likely to require. If you hire a robot, you are likely to have more technical help on hand, rather than having to deal with any issues yourself. You may well find that robot hire is a very cost-effective option, especially if you don’t attend numerous trade events throughout the year. At the same time, hiring gives you the flexibility to wipe clean the content on the robot, or reuse the information for the next show. So give some thought now to how a robot could set your organisation apart next time you attend a trade show or similar event. Attract people to your stand with one – and get them talking about and remembering your brand.